Have you considered sod for your Lynnwood lawn? Quality sod is a sure thing. You don’t have to worry about grass seeds sprouting, pestilence, and dead spots. When you’re ready for sod choose a sod company with a positive impact on the environment. That starts locally. As a Northwest staple, the grass experts at Country Green Turf Farms have been helping local residents and businesses since 1988. When you need top-notch sod in Lynnwood, go green with Country Green. Our grasses are designed to thrive in the oceanic climate of the Northwest. Our sod is grown using custom mixtures. We provide sod for sports fields, lawns, and mixed applications. Why choose sod over lawn seeding? Sod provides some serious advantages DIY seeding can’t compare to. Our sod is fully mature and guaranteed. The best advantage to sod is our quality guarantee. DIY lawn seeding from scratch may not yield the best results. You could end up with dead grass, patches, seeds that don’t fully mature, and even complete lawn failure. Our sod is created from carefully developed mixtures designed for Northwest weather. Why accept any less? Our fields are fully fumigated. Fumigation provides the best grass available. If you choose a sod company that doesn’t fumigate, watch out. You may be installing embedded pests directly into your yard. Not only will that negatively affect your new growth areas, it can extend to your existing law. The right grass for your application. Our sod experts help you at every step—even if you’re installing our sod yourself. We’ll identify the best mixtures for your needs. Whether you want added strength in shade, sports turf, or other specific benefits, we have the right mixture for you. Lower costs from the start. As one of the Lynnwood areas largest turf farms, we reduce costs for any application. 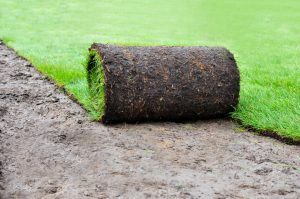 We can install big roll sod. These are faster to roll out and reduce labor costs. This makes them perfect for large scale sod laying of fields, mixed use, and sports areas. The right sod company for the job. We’ve been family owned since 1988, turning a 5-acre patch into a thriving 660-acre business. Our reputation for providing the best sod and sod installation in Lynnwood is hard-earned, and we never stop earning it. When you want a beautiful lawn that’s resilient and healthy, there’s no better choice.